Quest Forward Academy empowers students by enabling them to pursue their interests with guidance from mentors. Today, social media is a significant influence in students’ lives, and we think it is important for students to practice using social media to tell our school’s story on Facebook and Instagram. With this approach, all posts would be from a student perspective, related to the daily happenings at school. The trick, however, is how mentors would screen proposed posts and help with the editing process prior to publication. The Class Intercom app solved this issue. While students use its tools to become effective social media writers and editors, mentors have a role as their moderators and administrators. At Quest Forward Academy Omaha, students use Class Intercom to create posts about their work at school. Once a post has been created, it passes to a Journalism student who has been given editorial privileges in the app. The Journalism student then edits the post or works with the creator to refine it as needed. When the editor feels that the post is ready for the public, they pass it to a moderator—in Quest Forward Academy Omaha’s case, the Journalism Mentor. Though all posts require approval from a mentor to be published, mentors provide last-minute edits and final approval. Students do everything else, from coming up with an idea, writing it, and reworking it if necessary. This student-first mentality has empowered students to tell the story of Quest Forward Academy in their own words and images. Journalism student Bailee says of Class Intercom, “As a future photographer, it allows me to practice new skills. I am always looking at other posts for inspiration and compare my work to others’.” Class Intercom gives students agency in the storytelling about the life of the Academies. For other students, Class Intercom is a way to expose student work to a larger audience. Most of the posts on social media have been created by students, and many of those posts highlight artifacts, speeches, poems, scientific experiments, debates, guest speakers, and more. Not only do students get their work featured, but the post creators can feel an important sense of pride for their work. Natalia, a Foundation Phase Journalism student says, “It’s cool to see my post make it to social media.” Class Intercom is inspiring students to tell their own stories and be proud of the results. Annel, the senior editor of content and an Exploration Phase student, says, “Students are putting their honest views of the school in their posts without teacher direction. We get to create posts that show what we do at the school from our point of view, without someone forcing a different perspective.” The students represent the Academies in an authentic way that conveys how education here is different from traditional approaches. This doesn’t mean that mentors do not contribute, but that a majority of what is displayed should be student choice. Having that choice has helped students begin to see how their work impacts more than just themselves and to see the importance of the Essential Habits. “We are learning to manage ourselves! (Editor’s note: “Manage Yourself” is one of the Quest Forward Essential Habits students work on throughout the year.) We feel more accomplished without mentors telling us what to compose,” says Natalia—and that is true. Students have embraced the opportunity to create and to think of school activities as opportunities to practice their journalism skills. Class Intercom has given students the ability to demonstrate the best parts of Quest Forward Academy from the best vantage point possible: theirs. Ed Vogel is the lead mentor for Reading, Writing, and Thinking at Quest Forward Academy Omaha. 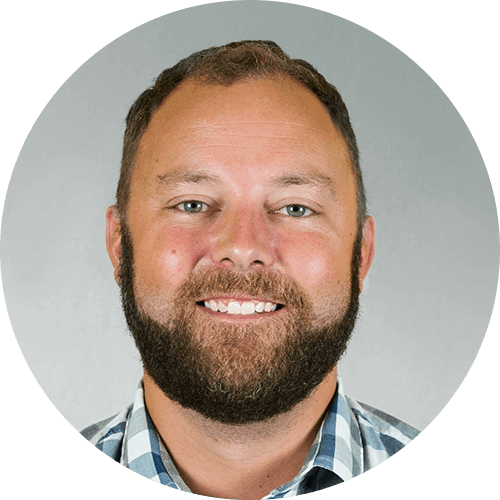 With several years of teaching experience prior, Ed joined the Omaha Academy team in 2018 and has quickly integrated the foundational aspects Quest Forward Learning into his everyday teaching.